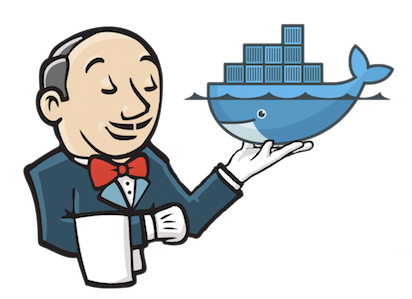 On my previous blog post I explained how to use docker from Jenkins. You have to register the docker image you want to use as a slave in Jenkins global configuration, and rebuild the image when your environment requires some changes. Dockefile has to define a ssh server, just to act as a jenkins slave, unrelated to your project needs. Docker plugin isn't elastic, even being a "Cloud" Jenkins plugin. It relies on a static docker-enabled host to run containers. I'd like to keep the Cloud principle to get resources as needed. You use your SCM to store both project source code, build script and a Dockerfile that describes your build environment. oki docki will use your Dockerfile to build+run a container and execute build script. You may notice the docker image isn't pushed to a repository. This is intentional. I like the idea I can rebuild my docker image at any time from scratch, not relying on some binary deployed somewhere. Thanks to Docker incremental build, this isn't such time-consuming. no need to setup anything on jenkins, just have docker-enabled slaves. I'm using a "docker" label for this purpose. This one can benefit from jenkins Cloud slave providers. Dockerfile just defines requirements to build your project. All yours to select a specific JDK, system packages or nodejs version. The same Dockerfile can be used by developers to get a ready-to-use development environment. project Dockerfile is stored in SCM, with application code and build scripts, and all is kept in sync without manual steps. You can have a distinct Dockerfile in a branch if needed. The current implementation is more a Proof-of-concept than a production-ready plugin, but already let you run a build inside Dockerfile. My initial goal was to start the container and then let jenkins run any regular build steps inside, but this require some Jenkins-remoting redirection hack, which development skills I don't have. On the other side, I also think it make sense to define your CI process as a script store in SCM, not relying on a set of build steps configured in jenkins (must admit I like travis-ci approach on this topic).